Social networking sites serve their intended purpose: they allow us to keep in various degrees of contact with our relatives, friends, and the hundreds of people we don't really remember. But photo-sharing has become an impersonal experience; like a press release. 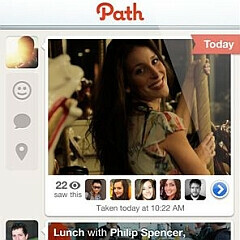 That's probably what has made Path a successful app on iOS. The photo (and video) sharing app limits your friend group to 50 people, ensuring that it's a more intimate experience. You can add emotions to your photos, tag people and places, and publish them to another social network if you wish. Upon the release of the Path app, many (including us) were concerned that a limit of 50 people would kill the Path community's growth. But it seems that the intimate approach has caught on, and the BlackBerry beta is now available (via the link below). We're not sure whether the BlackBerry features will be the same as those for iOS, but the video below will give you a general overview of the Path interface (minus the ridiculous romance). Path - Nervous at Home from Path on Vimeo.